zai takes home your Chongqing MVP award! Let’s be honest here — after their epic win over Virtus.pro in the Grand Final of The Chongqing Major, your MVP was only ever going to be a Team Secret player. That turned out to be the case, with Swedish offlaner Ludwig 'zai' Wåhlberg dominating our vote. 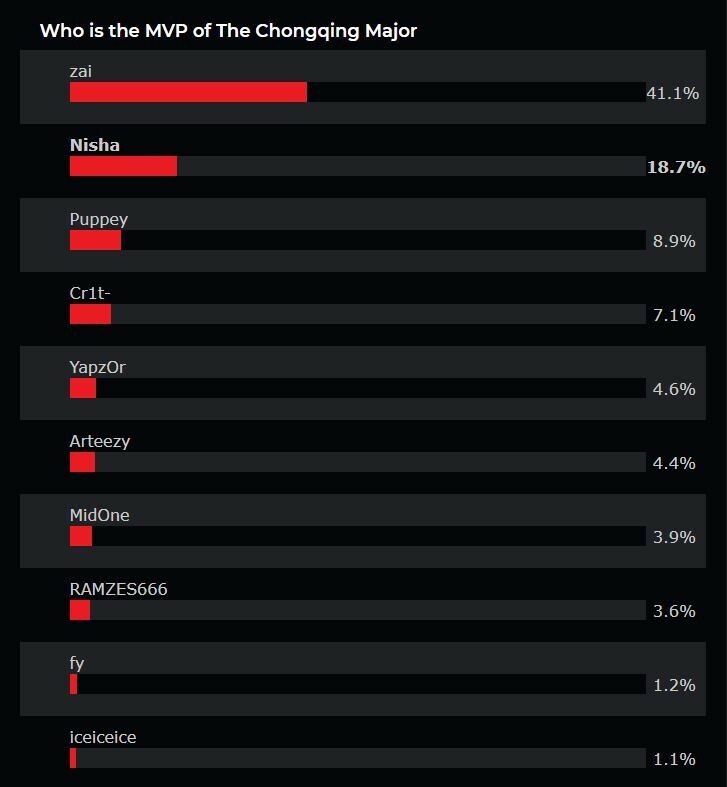 As you can see, nobody came close to dethroning zai in the vote. His score of 41.1% of the vote was exactly 22.4% ahead of team-mate Michał 'Nisha' Jankowski in second place, and a massive 32.2% more than his captain Clement 'Puppey' Ivanov in third. In fact, Team Secret occupied four of the top five slots in the vote, with Yazied 'YapzOr' Jaradat coming in just behind Evil Geniuses' star Andreas 'Cr1t-' Nielsen — a clear sign of their dominance in Chongqing. Do you agree with the vote?